Mediation is dispute resolution processes where parties appoint a neutral and impartial third party to enable them reach their own negotiated settlement. The mediator has no power to impose a settlement; rather, he or she assists parties to arrive at a mutually acceptable resolution of their dispute in the form of a contractually binding agreement. Mediation differs from direct negotiation as it involves the participation of an impartial third party. The process also differs from adjudication as it is consensual, informal, and usually private. The mediation process varies depending on the style of the mediator, the nature of the dispute, and the wishes of the parties. The mediator usually acts as a go-between amongst the parties, thus encouraging them to reach an agreement among one another as opposed to having it imposed upon them. Mediation has proven to be a very successful management tool for resolving difficult disputes. It is a means by which the parties can re-learn the basis of communication with which they, in turn, use to resolve future disputes. Mediation is particularly helpful in disputes where preservation of relationship is important. Before the parties mediate, some neutrals converse with lawyers, and sometimes also with the other parties to prepare both sides for the joint session. It is also an opportunity for the mediator to learn who will be involved in the sessions, the schedule of the mediation, as well as the emotional state of the parties involved. Many mediations begin with a session in which the parties, counsels, and mediators meet together. These sessions are held for various reasons i.e. monetary settlements, resolution of relationships etc. If the goal of the process is to find an interest-based solution or to repair a ruptured relationship, then a mediator is much more likely to draw out underlying issues and emotions – thus, resulting in possible dispute settlement. A “caucus” is a private meeting between the mediator and each party respectively. This is usually held out of the other party’s earshot. However, the predilection of the parties, aid the mediator in determining whether to caucus or not. On one hand, there is a chance that a party might be walled off from the other and ultimately, from true opportunities to collaborate on the best solution. On the other hand, there are instances whereby a party may be reluctant to disclose information to the other party but will be willing to share it with the mediator. In such situations, caucusing is very effective. Even in mediations conducted primarily through private caucusing, mediators sometimes ask parties to meet with each other for specific purposes. This might be to examine tax issues in businesses, to explore a licensing agreement in cases of patent claims, or to deal with difficult emotional issues in a tort case. At the end of the mediation process, more often than not, the respective parties and counsels sign a memorandum of agreement or meet to decide on future steps. Increasingly, the mediation process is not limited to the occasions on which the mediator and parties meet together. If a dispute is not resolved after a mediation procedure, the mediator is likely to follow up with the lawyers or parties via telephone or e-mail negotiations, or additional face-to-face session if the parties so wish. 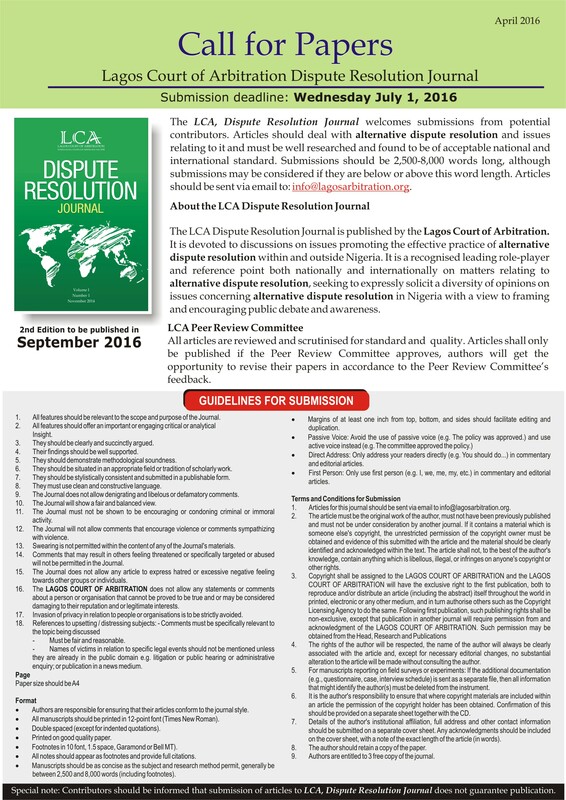 The LCA Mediation Guidelines 2011 (“the Guidelines”) governs mediation at the LCA. The guidelines assist in the effective resolution of disputes by mediation and ensure mediation proceedings are conducted expeditiously. The Mediation Guidelines are available for use by any party seeking to resolve their dispute via mediation. Parties may freely adopt the LCA Standard Mediation Submission Agreement for Existing Disputes. Words and spaces in square brackets should be deleted and completed appropriately. The LCA Secretariat is available for consultation and to assist parties regarding possible modifications to these standard clauses. Adjudication generally refers to processes of decision making that involve a neutral third party with the authority to determine a binding resolution through some form of judgment or award. Adjudications are commonly used for construction disputes due to their simple, effective and quick traits. In particular, adjudication ensures that construction and/or transactions in this industry, are not put on hold while the process is carried out. An adjudication is conducted by a sole adjudicator in accordance with the rules and terms of the contract and its applicable law. These adjudicators make decisions which are binding on the parties; in most cases, the decision of an adjudicator can be revised in another forum such as arbitration. Adjudications are common in construction disputes.